Decisions, decisions, decisions. Seen one way, our life is an almost uninterrupted sequence of decisions, many automatic and subconscious, some about which we deliberate consciously — and in some cases actually agonize over. 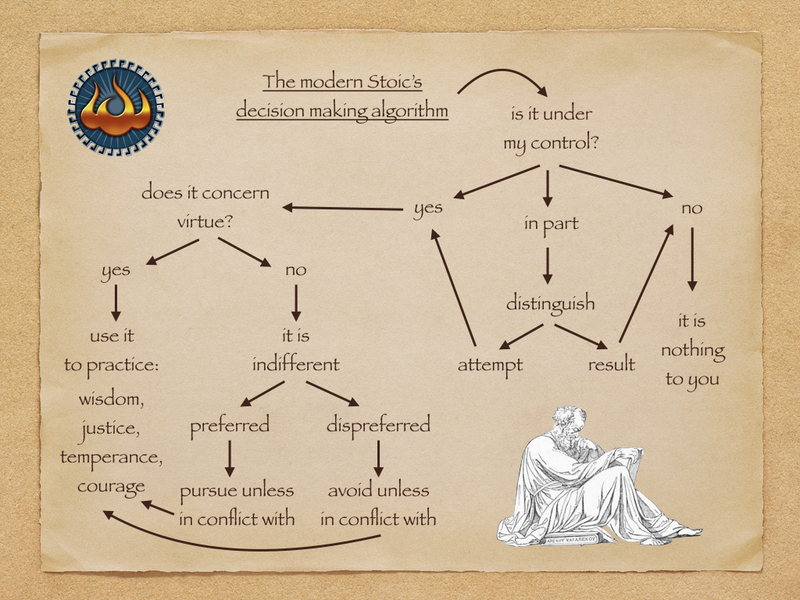 Below is a handy dandy decision making flow chart for the practical Stoic, in which I attempted to encapsulate a modern rendition of the basic precepts of Stoicism as they apply to everyday life. It doesn’t matter whether the decision to be made is comparatively trivial (should I have pasta or beef for dinner?) or momentous (is this the sort of profession I wish to pursue for the rest of my active life?). If our goal is to live the best life we can live, what the ancients call a eudaimonic existence, then we need to be mindful of what we do and why. If the answer is no, then the thing in question is nothing to you and you should not give it any further thought. It will be what it will be. If the answer is yes, then you move to the next question, on the top-left of the diagram. Before we get there, however, there is a third possibility — as Bill Irvine pointed out in his A Guide to the Good Life: you may have partial control over the issue. 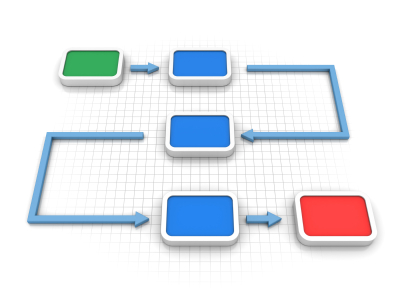 In this case Irvine advises, and I agree, to distinguish the part that is under your control from the one that isn’t, thus reducing the middle option to one of the other two in the diagram. Broadly speaking, the effort (or, as Irvine puts it, the internal goal) is up to you, while the outcome (the external goal) is not, because other circumstances may interfere with it. Moving now to the left part of the diagram, consider the question: does it concern virtue? The pursuit of virtue, for the Stoics (and for Socrates) was the Chief Good in life, the only thing that truly matters. If the answer is yes, then, your duty as a Stoic is to do whatever allows you to practice the four cardinal virtues of wisdom (the ability to determine the best course of action under difficult circumstances), justice (the most obviously socially oriented of the Stoic virtues), temperance (the most inward looking, concerned with controlling your own excesses), and courage (which does not have to be, and indeed often is not, just physical, but more broadly the determination to do the right thing). Suppose now that the answer is no, whatever you are considering doing doesn’t really affect the moral dimension encapsulated by the virtues. According to the Stoics, we are then talking about an “indifferent,” meaning not something that doesn’t matter, but rather something that does not concern your moral character, and is therefore not an aspect of the Chief Good. The Stoics, unlike the Cynics, recognized that human life isn’t all about virtue, it has many other dimensions as well. Some of these dimensions have positive and some negative aspects. The first are “preferred” and include things like health, wealth, education, pleasure. The second ones are “dispreferred” and encompass sickness, poverty, ignorance, pain. It is permissible for a Stoic to seek the preferred indifferents and to stay away from the dispreferred ones, so long as doing so does not interfere with the virtues. This is a crucial point: it is fine, say, to enjoy a good meal (pleasure), but not if your food has been procured by inflicting unnecessary suffering on animals (some Stoics were vegetarian, but this is not a necessity), or at the cost of significant environmental damage. Conversely, it is both natural and permissible to avoid pain, but not if it means, say, that you are giving up your friends and family’s whereabouts to a torturer bent on killing them (this is why the Sage — the ideal Stoic — is “happy,” meaning virtuous, even on the rack). This entry was posted in What Would a Stoic Do? on December 8, 2015 by Massimo. I agree. But that symbol in the upper left is Buddhist….. I do not know what to make of your choice. I dabble in both philosophies. I know that there are a great many similarities, but the emphasis is different. Life goes on and the pyre is where we all end but…. This practice is changing my life for the better. Thank you for this blog and sharing your knowledge. Fred, the symbol may be similar to a Buddhist one (I don’t know) but it was designed by someone with Stoicism in mind. Follow the link in the article to find out more. It’s a helpful summary though I’m sure you know that there are complications. The most obvious to my mind is that it presumes an ability to distinguish matters of virtue from indifferents before then applying the core virtues (or not). However, it surely takes some wisdom in the first place to make that distinction (vegetarianism would be a good example as I’m sure stoics would disagree on where their rational faculties lead them with regards to whether or not meat eating is vice or preferred indifferent). Great post, Massimo! I have been following your blog from some time now (reading the backlog, mostly!) and this post resonated strongly with me. I struggle a little with justifying the choice for the preferred but not virtuous actions (e.g., should I go to dinner or refrain in order to test my stoic resolve?). Where to draw the line between choosing the virtuous or, let’s say, being “lazy” and choosing a preferred action? Or they don’t conflict and I misunderstood it? indeed, things are not quite that simple, but I was aiming for a handy dandy guide, not for completeness. Yes, some degree of virtue is required even to correctly identify what is and is not indifferent, and reasonable Stoics could disagree about specific cases (though not, presumably, the ideal Sage!). glad to hear you find the blog useful, and this post in particular. I don’t think there is a fact of the matter about which choice is unquestionably the best one in a number of cases. Just remember that Stoics are not Cynics, so they don’t go always (or even often) for self-negation. Also, you may want to look at Becker’s treatment of these issues in his A New Stoicism, about which I have commented a number of times on this blog. The preferred/dispreferred indifferents always felt unsatisfying as a heuristic because psychology shows that we abuse logic to justify our choices. The flexibility of preferred/dispreffered indifferents makes it way too easy to slip into epicureanism and then quickly tumble into hedonism for those who are not sages (everybody). I understand and share your concern, but I don’t think this is a problem just for Stoicism, or just for the concept of preferred/dispreferred indifferent. It affects pretty much all aspects of human life and decision making. From a Stoic perspective, I’d say that part of the process of becoming wiser is precisely the ability to recognize one’s own cognitive biases and to try to counter them. Something that is made easier by exposing ourselves to “peer review,” if you will. The latter is in part what I’m doing with this blog, but we can take a clue from Aristotle as well, when he said that the higher form of friendship is the friendship of virtue — achieved when your friends are good enough to function as a “mirror to your soul” to help you improve your eudaimonic efforts. I have a view on the preferred/dispreferred indifferent question. I don’t think it is ever really necessary to practice discomforting oneself just for the sake of experiencing the discomfort itself. I also don’t think there are such things as actions, or choices that are completely removed from virtue as suggested in the diagram. So I am not enamored with the concept of indifferents. As an example of the first point I am trying to make I will refer to a friend of mine who practiced martial arts. He was encouraged by his instructor to punch walls to increase his toughness and make his hands more tolerant to impact. What he got was multiple broken nuckles. He was very diligent and even with the inuries would let them heal a bit and then continue the activity. I need not mention the long-term result was not favorable. On the other hand there are many ways in which we can expose ourselves intentionally to discomfort in the context of an understanding of how the adaptation process actually works in the world we inhabit. This can be a transformative process both mentally and physically if the balance of the stress and the recovery is proper for the activity. A simple example I have used in the past is physical endurance training which also has cognitive benefits when the right balance is found. This is the primary principle I use to practice the cultivation of virtue and why I would be hard pressed to think of any non-trivial example of actions or choices that would qualify as ‘indifferent’ to virtue. I’m not sure about “necessary,” but I find it an interesting aspect of Stoic practice. Your martial arts friends, however, did obviously take it too far. We are talking abut mild things, like a cold shower, or abstaining from food once in a while. I find these things helpful, at the very least, to make me appreciate what I have and enjoy in life. Lots of minor pleasures or discomfort in life don’t seem to me to be directly pertinent to virtue. Whether I’m sick or healthy also doesn’t affect my moral worth or practice. Whether I’m rich or poor. And so forth. thanks for the corrections, implemented! The topic was about choices or decisions. I agree that things beyond our control that result in discomfort or pleasure are not the concern of virtue, yet I think how we respond and what we choose to do are. Basically it looks like a logical contradiction in the diagram where a path choice determined not to concern virtue is then asked if the option to be chosen conflicts with virtue. I think the use of our agency is our tool to cultivate virtue. When we don’t use it (assuming we had some degree of control) that is opportunity lost. This is why equanimity is important as it allows us better vision of how or when we can act in the service of virtue. Of course some choices are minor in degree concerned to others. I do think health and wellness relates to the effectiveness of our agency to some degree. I would not say they are concerns of our moral worth but they certainly impact our virtuous capacity and should be pursued when we have control to do so. I don’t think there is a contradiction in the diagram. One question asks whether something is normally categorized under indifferents. Say that something is pleasure, the pursuit of which is not directly an exercise in any of the virtues. Next, however, pursuing some pleasures may in fact interfere with virtue, for instance if in order to obtain said pleasure one has to do something unjust. Hence the follow up possibility on the lower left portion of the diagram. Equating the pursuit of agency with the virtues is a big, and I think unwarranted, move. Becker attempts that in his A New Stoicism, but not convincingly, I think, and at any rate even he has to bring in the moral dimension separately, or risk having to contemplate a “virtuous” serial killer who cultivates his agency to the max. As for health and wellness, they do relate to the effectiveness of our agency, but, again, unless one equates agency with virtue, your conclusion doesn’t seem to follow. One of the things I like about Stoicism is that it tells you that you can be virtuous pretty much regardless of your circumstances, whether you are sick or healthy, poor or rich, and so forth. But clearly one has heightened agency if one is healthy and wealthy. To go from there to the statement that such a person has a more eudaimonic life than the poor and sick is to go Aristotelian. Indeed, that’s the major difference between Stoics and Peripatetics. So I agree with you that wealth and health (and education) should be pursued, but no, they do not affect our virtue, only four agency. That’s why they are (preferred) indifferents. If one can predict ahead of time that pursuing a specific pleasure interferes with virtue then I don’t think it is removed from virtue. In your reply you say ‘pursuit of which is not directly an exercise in any of the virtues’. I think this where we see it differently. I am hard pressed to think of any choices I make that have no relation what so ever to my virtuous behavior going forward. I won’t speak for others but I know that I am a creature of habits. Cultivating good habits in even seemingly small things seem to carry forward. Eating more than I should have, putting off that little task I should be doing, responding to a social situation with less grace than I could have, etc…..Establishing the good habit in place of the immediately pleasurable choice until the good habit results in the virtuous choice itself as being pleasurable. Don’t get me wrong, I don’t think we should be deliberating every little action. But I find it very useful to watch with some awareness how I am behaving and how my internal narrative is going so that I can avoid falling into extended bad behavior or thinking even with the small stuff. On agency and virtue I agree that the direction which in we apply our agency is more important than how much we have. A little positive influence is certainly preferable to a big negative influence. I never said agency was equal to virtue, I said it was our tool to cultivate virtue. Like any tool it can used properly or improperly.